My name is Rolli and this cat diary was my idea. My human Mommy, Leena, was too busy searching for information about all those different cat breeds - a very noble thing in it itself and very much to be encouraged - that she had no time to take it easy and look at the world as it should be. That means: relaxed. You people really take things too seriously and are working all the time... 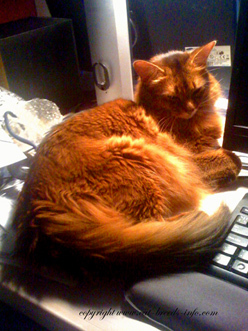 I take it as my duty to interrupt Mommy every once in a while and lay down on her keyboard or take a nap over her hands or anything to stop that constant drumming of the keyboard. How can you relax if you are drumming all the time? So: this diary gives voice to cats. Mine, to be specific. But I may give other cats a chance to voice their opinion also. 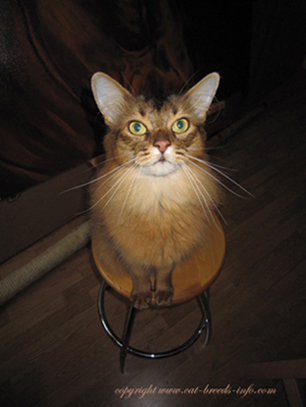 I am a Somali cat, which is the best breed, as everyone knows. (Well, Hippu and Pipsa who own the folks here at home together with me count as Somalis too. They just have a pitifully short hair and are called Abys, but basically we are the same breed). But this is not to say I would not appreciate other cat breeds, oh no. As everyone is aware, there is no other animal as beautiful, mysterious, divine, gorgeous and beautiful (did I say that already?) and purrrfect as the Cat. Not for the weak of tummy. Yoga as it should be. The Cat Way. Cats do window shopping too!